The intricate designs of Persian rugs, displaying a beautiful and symbolic arrangement, have fascinated art lovers throughout the world for centuries. As far as design is concerned, Persian rugs can basically be divided into two main groups; those with a geometric design, and rugs with a curvilinear (also known as floral) design. Rugs of the first group are decorated with linear elements composed of vertical, horizontal, and diagonal lines or formed by a repetition of the same motifs. These rugs are woven by nomadic tribes and their particular motifs help identify their origin. In this group, designs are strongly influenced by the weaver’s immediate surrounding, nature and all individual objects found in it. The more formal design of floral rugs consists of flowers, trees and their branches and a variety of leaves, often connected so artistically to form a wonderful harmony. In majority of these rugs, the most common motif is a large center medallion surrounded by a variety of flowers both throughout the field and the border of the rug. It is interesting to note that no two medallions are ever exactly the same. Some of the so called experts believe that the medallion is to represent the sun, a center of gravity, or perhaps the earth in the heart of the universe. Others believe that it merely comes from the religious nature of the weavers and that their inspiration probably came from the domes of the mosques. Patterns of historic monuments and buildings: In creating these patterns, the designers have been inspired by the tile work, structure, and geometric shapes of ancient buildings. 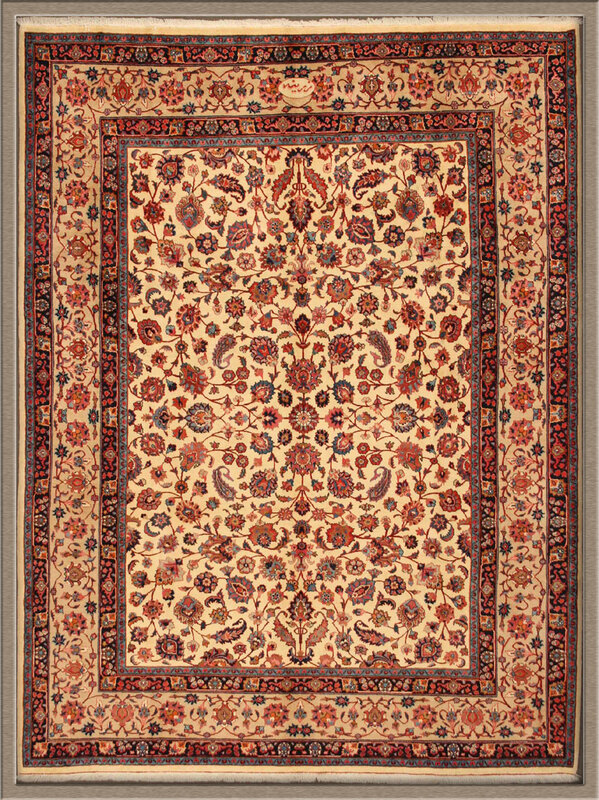 Shah Abbasi patterns: In this group, the principal motif is a special flower known as Shah Abbasi and is often set off by other flowers and leaves in the background and border. Spiral patterns: The original of this group is composed of spiraling branches surrounded by leaves. The end of each branch splits to resemble the jaws of a dragon. Allover patterns: All parts of the design are usually related and connected and there is no medallion, or it is not clearly visible as it becomes part of the design. Derivative patterns: such as Afghani, Caucasian, and Gobelin which are believed to be originally Persian and at some point borrowed by neighboring countries. 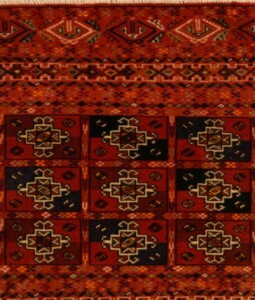 Bandi patterns: In this group, a small piece of the design is repeated and connected throughout the length and the width of the rug. Paisley patterns: The basis of these designs is the head-bent paisley motif in a variety of shapes and sizes. Tree patterns: Although stylized branches are a common motif in Persian rug designs, tree patterns are distinctive for their close resemblance to natural forms. 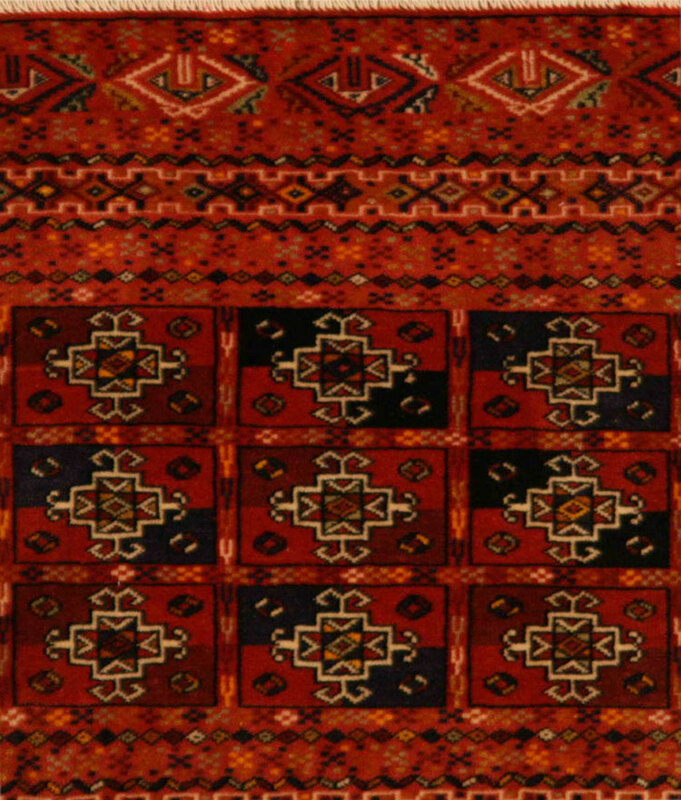 Turkaman (Bokhara) patterns: Incorporating geometrical shapes and broken lines, these patterns are of the nomadic type; products of the weaver’s imagination rather than reproduction of drawn designs. Hunting Ground patterns: As with the tree patterns, the animals depicted in these rugs are lifelike. Panel patterns: The basis of this design is a multi-sided panel motif found in rugs of Quom, Bakhtiari, Kerman, and Tabriz. European Flower patterns: These patterns are compositions of original Persian designs with roses in light and dark colors. Vase patterns: In these patterns, vases are used in different sizes: a large vase may cover the whole field of the rug or a small vase may be repeated throughout the ground. Fish patterns: Although varied and enriched by modern designs, this pattern, originally a product of the nomadic imagination, retains its tribal character. First woven in Birjand in the province of Khorassan, the design spread to become common as far away as Hamadan and Azerbaijan, where each area made its own distinctive alterations. Mehrab patterns: The original pattern represents the place in a mosque where the prayer leader stands and is ornamented with pillars, chandeliers, and flowers. Striped (Moharramat) patterns: This name is applied to designs which are repeated in stripes running the length of a rug, each stripe having its own special motifs and colors. Geometrical patterns: These patterns have lines and geometrical shapes such as polygons, in contrast to the majority of Persian designs which have lines moving in curves and circles. Tribal patterns: The oldest and most original of Persian rug patterns, these elegantly simple creations of the tribal imagination were inspired by their natural surroundings. Transferred by designers from one region to another all over the Persian kingdom, most of the patterns are named after the places they were first woven or after the influential individuals who ordered the weaving done. Composites: In addition to all original patterns, each of which has a special name and history, with the passage of time, new patterns have been created by combining two or more of the original patterns. The weaving of an Oriental carpet or a Persian rug is a sophisticated and time-consuming process. However, in this article, we will be trying to explain it in a more simple form by ignoring the preparation of the loom, and concentrate on the weaving itself which always starts at the lower edge of the carpet with the selvedge. A certain number of weft threads are inserted across the vertical warp threads so as to form a stout edging which will keep the carpet intact, prevent fraying, and keep the knots tight. The weaving of the pile begins once the selvedge is prepared. Each single knot, either symmetric or asymmetric is tied on two adjoining warp threads. The number of knots per square inch (KPSI) is an important factor to consider when determining the price. On average, a trained weaver will tie around 14,000 knots each day. For example, a six foot by nine foot rug with a KPSI of about 200 will take over five months to make, and it will only grow by less than an inch across the whole width after a day of hard work. The weaver will tighten the knot by pulling it in a downward direction, thus creating a direction to the nap. This is why a handmade rug will appear lighter if you look at it with the direction of the pile, and darker if you look against it. When laying a rug in your room, it is important to try it out in different positions. When a row of knots across the width of the warp is finished, the weaver passes one or more shots of weft thread over the knots in and out of each of the vertical warp threads. When two weft threads are being used, one is generally tight and the other loose. The number of weft threads depends on the weaving style of the region, and thus helps identify the origin of hand-knotted rugs. Each row of knots is cut individually. Often, the pile is given its first cropping after four or six rows of knots have been tied onto the foundation. The final cropping will not take place until the carpet is finished and washed. As a rule, very fine rugs are cropped very low, while a deeper pile is left on pieces with a lower KPSI, because if these carpets were close-cropped the poor quality of the fabric would be revealed. According to the demands of the market however, the style and the height of the cropping may be adjusted. Millions of differently colored knots are patiently aligned one against the other to form the patterns and motifs of these beautiful works of art. Patterns are sometimes geometric, sometimes floral, but always full of imagination and style. Colors and designs often grow instinctively out of the basic traditions of the nomads. There is no prearranged plan, but rather just a general idea which takes into account the shape of the rug to be woven, the symbols and motifs which are to appear on it and the colors available. All the rest is imagination, skill, and the natural creativity of the weaver. In the cities on the other hand, where rugs are often produced at organized workshops, the rug is born of a precise project by specialized artists who create the design on a squared cartoon on which each square represents a knot. When the rug is to be made by one person on his own, the cartoon is fixed to the loom at the worker’s eye level. When two or more people are involved in the task, one of them reads aloud the number of knots of each color. Often, this sounds like a harmonious song. In organized workshops where there are many workers, the weaving is led by the “master” who supervises the entire production of the rug and is personally responsible for the most important parts of it. The rug is finished with a selvedge just as it was begun. The surplus warp threads on each end of the rug are used for the fringe which can be knotted or kept in place by means of what is called a chain stitching. When the rug is removed from the loom, it is given a careful wash and a final cropping of the pile. Then point of the washing process is to remove the stiffness from the rug and to restore the wool and the colors to their full purity. The rug is then spread out to dry in the sun and this is the last test of color fastness. The rug is now ready to be shipped to a retail store and purchased by its new owner to be enjoyed for many years to come. The Oriental carpet or Persian rug that you own is a work of art and it is important to know that it deserves the same attention and care you would accord to a fine piece of furniture in your home. We often come in contact with customers who are willing to pay more for repair services on a piece of hand-knotted rug than the rug is actually worth mainly due to the fact that it has some sort of sentimental value to them. It could be a token of remembrance from grandpa or a piece someone has grown up with in their childhood room or simply something that just looks perfect in their living room. Your efforts in restoring an Oriental carpet or Persian area rug will be rewarded time and time again through years of lasting satisfaction with the unique beauty of your investment. If you discover a worn spot, a hole, or a tear in your rug, seek professional assistance at once because the damage can only get bigger and bigger before you know it. The same applies if you notice a ragged fringe or a loose selvedge binding on your area rug. In most cases, the fringe and the side bindings are in fact the first spots requiring your attention as they are the areas mostly exposed to vacuum cleaners, high traffic, usual spills, and high-heeled shoes. A reputable Oriental rug dealer can either attend to such repairs or they can refer you to a professional repair facility. Estimates can always be obtained free of charge. Keep in mind that you will be entitled to understand exactly what the restoration procedure is and what kind of work needs to be done to your rug before you make the final decision. Many professional repair facilities can provide you with before and after pictures of their previous work on some rugs, and you will usually be able to check references as well. The secret to a professionally done repair work on your rug simply comes down to the ability of the repair person to imitate the original work. After all, you are dealing with a work that has been done with hands in the past and the repair is just supposed to come as close to it as possible. The structure of the foundation, the thickness of the warp and weft, the number of the weft shots inserted over the knots, the texture and the material of the pile fibers, and the type of the knot (symmetric or asymmetric) used in the original work needs to be carefully examined before a repair work gets started with its beginning phase. It is obvious that matching the colors is often the most important part of the whole process. In fact, a competent repair person can dye some raw wool to come very close to the colors used in your rug if he or she has the necessary experience. However, achieving a perfect match is not possible in many cases and you need to keep in mind that a repair job will require some degree of compromise on your side. Our advice to you is that you seek professional help and avoid do-it-yourself remedies at all costs should any problems arise and that preventing any damages in the first place would always be the safest route to take. Although some of the special techniques involved in weaving a Persian carpet or an Oriental rug may vary from country to country, and even from one region to another, the main principles of weaving rugs – from dyeing the yarn to shearing the finished piece – are practically the same throughout the world and have remained within its traditional boundaries over the centuries. Still, a basic understanding of the construction of an Oriental rug can be extremely valuable to you when selecting a handmade carpet for your home. In general, most Persian rugs feature a wool pile, originated from sheep, whose quality depends on factors such as the animal’s breed and diet, local climate, altitude of its habitat, and shearing season. After shearing, the wool is washed, carded (to straighten the fibers), and then either hand-spun or machine-spun into yarn. Next, the yarn is dyed in desired colors and then dried slowly in the sun. The wool may get washed several times before it is ready to be utilized by weavers. A detailed illustration of the design of the rug to be made, commonly called a cartoon, guides the weavers throughout the entire process of making a rug. The design is rendered to scale on graph paper. For centuries, looms have remained relatively unchanged. While the most primitive is the nomadic or horizontal loom, the type most generally used today consists of two vertical beams of either wood or metal, and two similarly made horizontal beams forming a frame. The distance between the vertical beams determines the rug’s width. As to the length of the rug, the weaver can normally roll the bottom part of the rug as the work proceeds, thus extending the length of the rug beyond the limits of the horizontal beams. Warp threads, which are usually made of cotton, are strung between the horizontal beams at a consistent tension. This work is done by professionals; otherwise, at the hands of inexperienced individuals, the final product may show bubbles and creases. The thickness of the warp threads and the closeness at which they are strung are two of the elements that will determine the fineness of the weave (knot density) of the carpet that is ultimately woven. 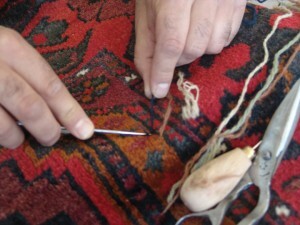 There are two types of knots used in rug weaving. The symmetrical Turkish, and the asymmetrical Persian knot. With the average weaver able to tie about 14,000 symmetrical or asymmetrical knots per day, several weavers working together can only complete 1 or 2 inches of the rug each day. Before the actual knotting of the pile begins, the rug is secured at the bottom of the loom by a short “flat weave”, which is woven by passing several rows of weft threads through alternate warp threads. The weaver will begin weaving the rug by reading the design from the cartoon and using the appropriately colored yarn for each individual knot, which is tied around two adjacent warps. Then the knot will be pushed down to the base of the weft and the excess yarn is cut, thereby producing the pile. After each row of knots is completed, one or more threads of the weft are inserted to secure the knots and are beaten down tightly with a comb-like tool. At this point, a new row of knots will be started and the process will continue until the rug is finished. Before removing the rug from the loom, another “flat weave” is woven at the top. As the rug is cut from the loom, the fringe at both ends will be formed. Now it is time to perform the final finishing steps. 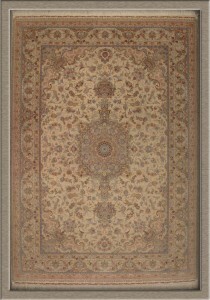 A wool binding or overcast, usually the same color as the main color of the field, will reinforce the edges of the rug. Then the warp threads are knotted or braided to form the rug’s fringe. The rug is then washed to eliminate dust and dirt that may have accumulated during weaving. The wash will also give the rug an exquisite sheen and luster by softening the colors. Once the rug is dried, the pile is sheared to create a uniform height. The rug is now complete and ready to be placed on the market. Now you have a better understanding of the time-consuming process of weaving a rug. For ages, Persian rugs have been a symbol of the art, history, and romance of ancient civilizations. In spite of so much improvement in technology used to produce machine-made carpets, hand-woven rugs have maintained their place as an attractive, masterful, and valuable product. The art of rug weaving has continued its rich and noble life as a symbol of the genuine heritage of the skillful Persian artisans. Hand-knotted Persian rugs satisfy aesthetic feelings as well as practical needs. Their merit as a gorgeous and decorative addition to the home is matched by their value as a safe and constantly increasing investment. Today, there are greater numbers of people who wish to own an authentic piece of Persian rug all over the world. The popularity of Persian rugs, new or antique, remains undisputable. They will forever be prized for their individual and unique quality. Each rug is the product of a centuries-old cultural heritage particular to its originating village, district, or tribe. Due to the existence of so many diverse cultures, having their roots in the tribal and regional traditions, there are endless patterns and motifs used in Persian rugs. 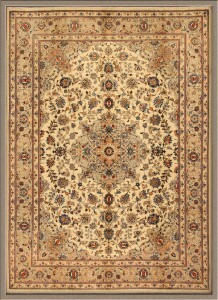 As a result, there has been a rising amount of rugs produced in other countries imitating Persian designs. In fact, such production has become a major occupation for so many weavers throughout the world. While the value of genuine pieces of handmade rugs tend to appreciate over time, poor imitations, like any other ordinary floor covering, lose their value over time. The rich nature of the country has always provided the best quality of wool, cotton, and silk to be used by Persian weavers. The long-staple wool of the sheep raised in highlands creates unique qualities of spinnability, flexibility, and resistance against compression. The colors of natural material, such as insects and plants, enable Persian rugs to retain their brilliant shades as they age. The experienced dyers carry on the glorious traditions of the past in order to create magnificent and durable colors that will beautify any environment. Likewise, the weaving itself has been kept close to traditions of the past as the installation of a loom in private homes is not merely a means of providing financial profits, but is also aimed towards the enjoyment of the whole family. While large city workshops were an important factor in the past, much of today’s production of rugs is carried out along cottage industry lines in smaller villages and towns. The buyer of a Persian rug not only delights of its beauties on the floor, but also owns a treasured heirloom which can be passed down to the next generations. Just to name a few of its numerous advantages, the rug industry adds an exceptionally high value to otherwise low-value materials, creates jobs for thousands of people in remote regions, promotes artistic works of art, improves quality of life in rural areas, and encourages exports to make a more self-sufficient population. Hopefully, the ever-increasing market demand for hand-knotted rugs will sustain the originality of this wonderful tradition thereby also supporting the livelihood of a large number of artisans in many different countries. Oriental and Persian rugs come in an enormously large variety of colors and designs piled up over the past few centuries. One of the main characteristics of handmade rugs to be examined is their age. Not only is it very difficult to determine the age of an Oriental rug or Persian carpet, it can also only be done approximately. As a general rule, any hand-knotted rugs over 100 years old are termed “antique”, those of between 50 and 100 years “semi-antique”, and those between 30-50 years are simply termed “old” pieces. The warp, in most cases cotton, runs vertically through the length of the rug and the weft, also normally cotton, runs horizontally across the rug. It logically follows that the fringe of a rug is actually the warp thread sticking out from either side of the rug and if you could pull it all the way out, you would end up with a missing thread of the fringe on both sides. The weft is inserted over each individual row of knots and pressed down with a special comb-like tool as the process of weaving the rug continues. There can be either one or two shots of weft on top of each row of knots. In fact, the number of weft threads as well as their color is a strong indication of its origin when it comes to Persian rugs which are always named after the city or village where they have been made. In a simple form, the thickness of the warp and weft threads determines the fineness of the quality. The Thinner the warp, the smaller the knots tied onto them giving way to a higher number of knots per square inch enabling the weaver to show more detail and creating a more intricate pattern. Similarly, the thinner weft means less space between rows of knots making the rug more tightly woven. We need to keep in mind that for a weaver with average speed, the higher KPSI also means longer weaving time. It becomes obvious that the KPSI as well as the size of the rug to be produced needs to be decided before the work begins. Handmade rugs come in many different qualities and KPSI ranges from around 50 to over 1000. Designs can be categorized as either geometric or floral. In typical geometric patterns, as the name implies, a few lozenges and octagons surrounded by other geometric motifs generously cover the middle field framed by a similar, primitive-looking border. As for floral designs, an elegant center medallion is emphasized against a background of contrasting color, filled with decorative flowers and spiral-shaped tendrils forced together by four corners, and finally framed by a border with as much detail as the field itself highlighting symmetry in a strong form. Generally speaking, floral, city-made rugs are more suitable for formal settings whereas geometric, village-made carpets go well in more casual environments. produced around Jaipur. However, the more important rug making centers for Persian rugs are scattered around the cities of Tabriz, Isfahan, Nain, Qum, Kashan, Kerman, Yazd, Mashad, Hamadan, Bijar, Abadeh, Cahar Mahal Bakhtiari, Birjand, Malayer, Arak, Tafresh, Shiraz, and Ardebil, each with their unique color combinations and designs, excellent examples of the magnificent craftsmanship of their creators. Qum is located only about 75 miles south of the capital city of Tehran. Even though some of the finest Persian rugs are woven in Qum, the history of weaving does not go back farther than 70 or 80 years. However, the city of Qum has become an important center for the Persian rug industry. 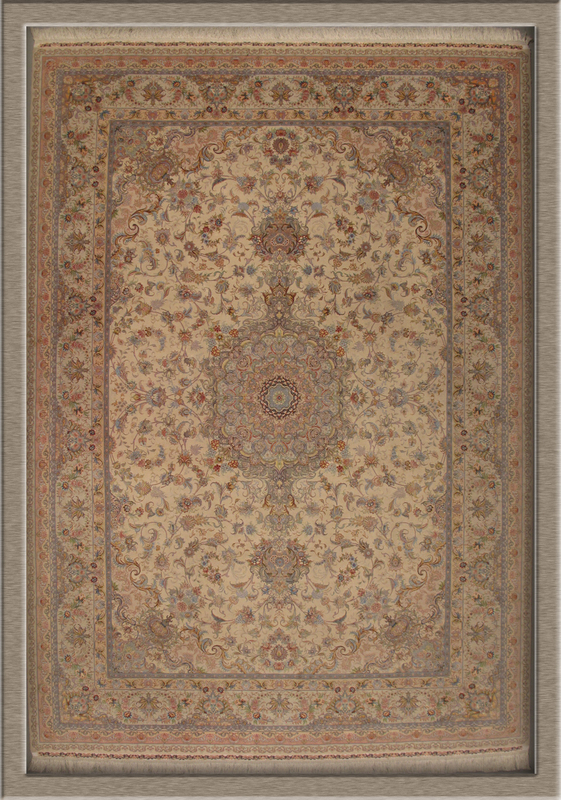 Qum rugs have immensely improved in quality over the past few decades. There have also been great innovations in design, to the extent that even some Caucasian patterns are being produced in Qum. Rug production started with a wool pile and silk highlights, but is today mostly concentrated on pure silk. Since around 1921 to 1941, European markets have shown an increasing demand for rugs with a finer weave and more delicate material. This gave way to production of higher quality rugs with silk highlights. As stronger demand emerged, weavers began to make pure silk rugs around the same time. 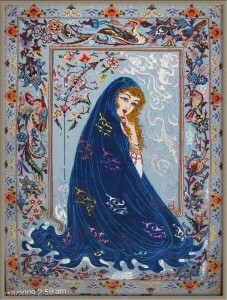 The imagination of artists as well as the strong support of buyers produced some luxurious and attractive city-made rugs enjoying a unique character compared to their rivals produced in other Persian cities. As a matter of fact, no other material has the ability to produce such elegant, delicate rugs, displaying a particular charm in different lights, and depending whether you are looking at the rug with or against the nap, as silk does. From surrounding cities and nearby villages, designers and producers rushed into the city of Qum to intensify the production of these wonderful pieces of art. The innovative success of emigrant master weavers and designers who had mainly come from Arak, Isfahan, and Kashan, in combining their local patterns and creating new harmonious styles led to the appearance of extremely rich, extraordinary designs in rugs of Qum. The dominant designs in these rugs include the traditional “Shah Abbasi” corner and medallion, the “tile” (Kheshti), daste gol (bouquet of flower), and a variety of other beautiful patterns. The palette of colors Qum weavers take advantage of is as rich as the range of designs. In fact, most experts believe the volume of innovative designs and bold choice of colors used in recent production of Qum rugs is more than all other types of Persian rugs put together. Rug weaving in Qum seems to have extended towards West and Southwestern parts of the region from Zanjan and Bijar to Qazvin and small communities to the West of Qum. Some famous weavers of Qum carpets enjoy an international recognition and are normally under the obligation of delivering every piece of their production – due to long-term contracts – to one or two importers for the Western markets. 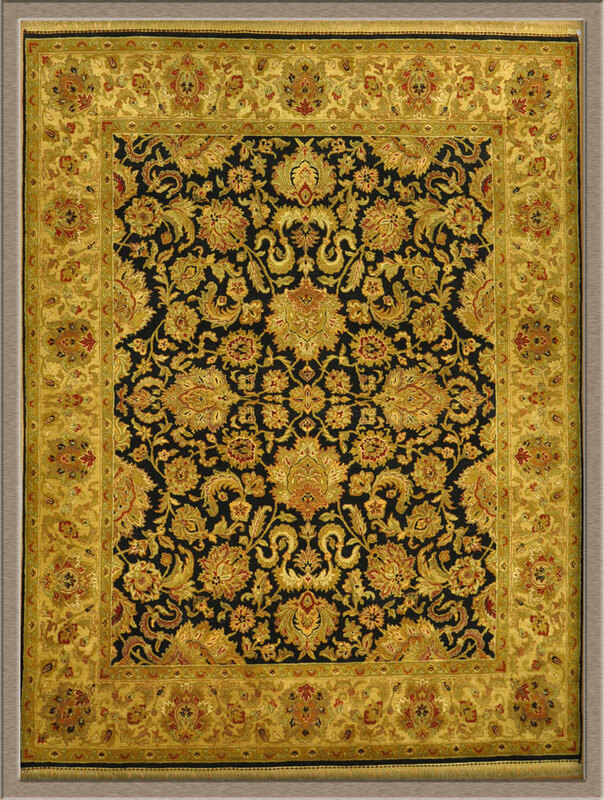 A higher quality silk Qum usually has the signature of either the workshop or the master weaver displayed either on the top or the bottom border. If the pile is wool, then it is always Kurk (wool from lamb’s neck) which makes the rug much softer. In such rugs, the foundation is normally cotton, but silk rugs almost always have a silk warp, and sometimes the weft may also be silk, making them even more valuable. Two shots of weft are inserted over each row of knots. 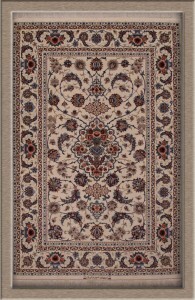 Qum rugs come in all sizes, and use traditional colors of red, dark blue, and ivory. 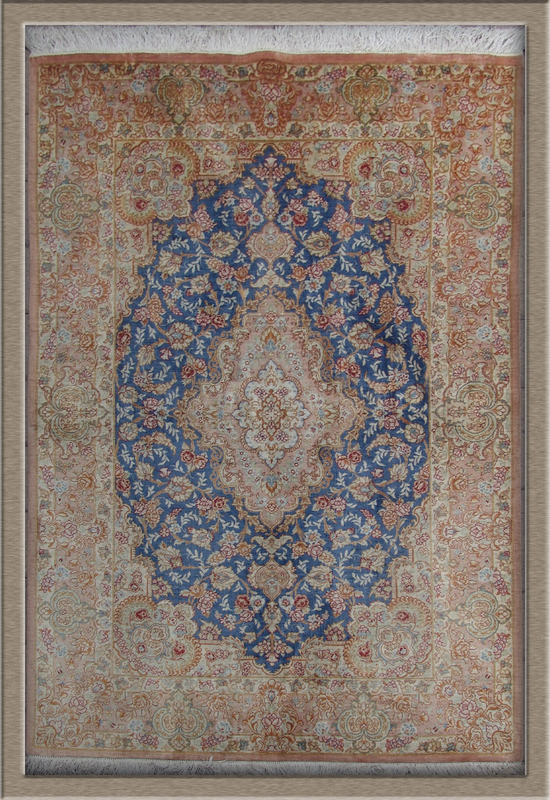 Tightly woven Qum rugs are magnificent pieces of art, and last forever. Knot count varies between 150 to over 1000 KPSI. The city of Isfahan is the capital of Isfahan province located about 200 miles south of Tehran known to have once been one of the largest cities in the world. It is one of the most famous cities in the Persian rug industry, a major producer of all types of handicraft, and also a major tourist attraction for the country. If there has been any Isfahan rugs produced before the Safavid dynasty, they are no longer in existence. It is believed that the popularity of Persian Isfahan rugs has its roots in the lost and forgotten art of rug weaving in Qazvin. During the Safavid era, many Persian artisans gathered in the new capital of Qazvin for a short period of time. 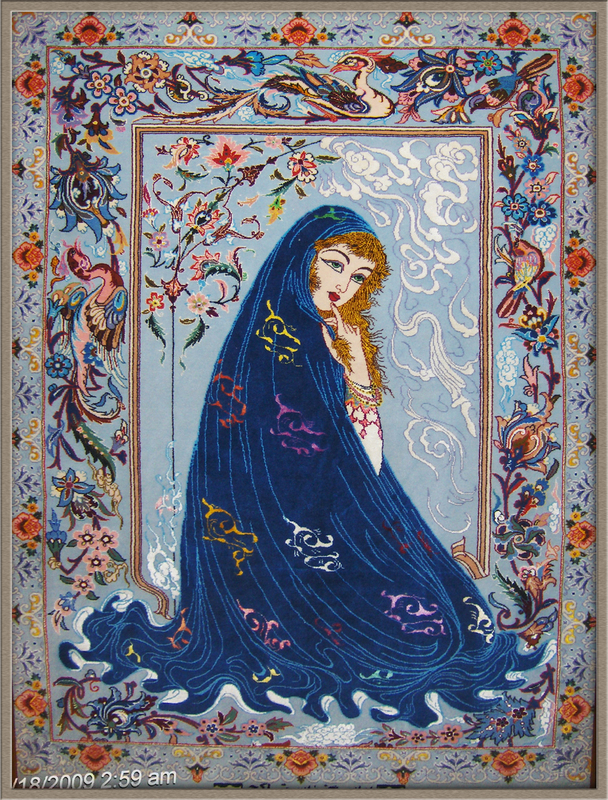 As the capital was later moved to Isfahan, the glorious epoch of Isfahan art began. Rug weaving was definitely a considerable part of this movement. 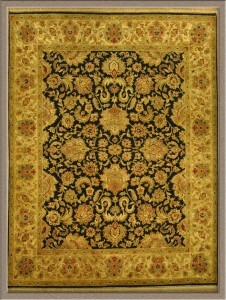 The establishment of royal carpet workshops during this time is an indication of the king’s special concern for Isfahan. Many pieces of Isfahan rugs produced in these workshops can now be found in museums and private collections. Many motifs found in Isfahan rugs have been inspired by decorative tile works of ancient monuments, to the extent that most researchers believe that the rug industry in Isfahan has always been influenced by the city’s historical buildings. This is perhaps why their production is often referred to as the most vivid example of classic “city carpets” within the Persian rug industry. Some of the best master weavers, designers, and artists belong to this region. 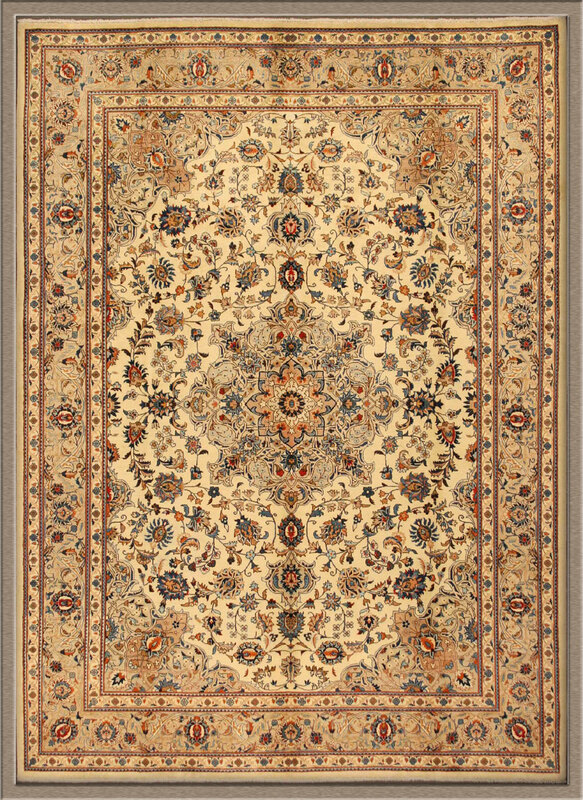 Isfahan rugs have a very traditional Persian design: a single medallion in the field, surrounded by “Shah Abbasi” flowers, and a border of a strong contrasting color against the field. Isfahan rugs come in all possible sizes. Quality of the wool is excellent, the warp is silk, and the weft is either silk or cotton. In some older pieces, cotton warp is more common. The pile usually consists of Kurk wool. Knots are compacted very tightly, and two shots of weft are inserted over each row of knots making them very durable pieces of floor covering. In Isfahan rugs, colors are also very traditional: different shades of red, ivory, and royal blue, with beige and soft green in recent production. Isfahan rugs are very durable, and a relatively large number of antique pieces can be found in many famous museums around the world. Unlike some other weaving centers which have very many neighboring villages producing similar rugs, Isfahan is not surrounded by any major rug producing communities. However, there are some rugs woven in neighboring cities (such as Najafabad and Shahreza) and called Isfahan by a common mistake. Isfahan rugs come in different qualities with the number of knots per square inch ranging from 150 up to over 800 KPSI. Hand-knotted Persian carpets and Oriental rugs are the very latest floor covering fashion statement. In fact, interior designers all over the world have discovered their impressive versatility in style, color, type, and size, and are using them to define or enhance not only residential but also commercial decors. Oriental area rugs and Persian carpets of today are woven to suit an infinite domain of decorative styles spanning the traditional Oriental looks to the European, Art Deco, and contemporary. 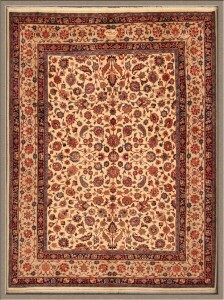 Buyers can choose, for example, Persian-style carpets featuring traditional hues or a wide array of timely decorative colorations. 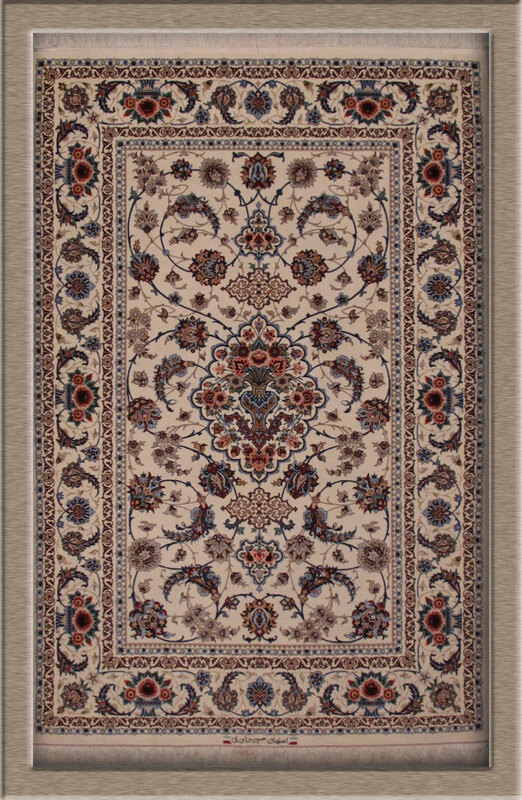 Also, In addition to the tremendous variety of pile rugs, the buyer can choose from an impressive selection of flat-woven pieces, including Indian Dhurries, Persian Kilim, chain-stitch, and Belgian needlepoint rugs. Moreover, sizes run the full gamut in response to the variety of today’s decorating needs. Reproductions of older pieces of Persian rugs easily coordinate with the fabrics and traditional furnishings of many Western homes. Most interior designers and rug dealers will advise that the most logical way to decorate a room is to start with your Oriental or Persian rug. By extracting a single color from the rug, one can influence the room setting’s entire color and design scheme including that of wall and floor covering, upholstery, curtains, and other window treatments. At the same time, a rug’s pattern can stimulate the mood for the particular furniture style to be utilized in the same room. For example, a hand-woven rug exhibiting the French floral Aubusson design could be the first step in establishing a formal French ambiance or at least some European mood in the room. However, incorporating the modern Oriental rug into an existing decor is now virtually problem-free thanks to the infinite variety available. A particular decorative scheme can inspire the use of a specific rug type and style. For instance, an 18th century English decor could be the ideal setting for an English-patterned needlepoint rug as well as for a traditional Chinese Peking carpet. On the other hand, in a less formal decorating environment an Indian Dhurrie or a Persian Kilim might be the perfect choice. Experienced home owners can testify that Persian carpets and Oriental area rugs can be used in a variety of room settings. In fact, with a little imagination you can transform an interior space into one that is vibrant with personality thanks to the addition of a handmade Oriental or Persian rug. Also, due to the tremendous (and increasing) variety in rug types and in the range of prices that have emerged during the last few decades, this decorating option is now within virtually every buyer’s reach. The floor of any room is perhaps the most prominent decorative component – accounting for one third of a room’s total space – and therefore deserves to be adorned with only the best. Persian and Oriental rugs can visually connect two otherwise unrelated spaces with much ease. A piece of Oriental Persian rug that you feel totally comfortable with will most likely look the best in your home. With the expanding choices available to today’s rug buyer, selecting the right piece of artwork for your floor requires a considerable amount of your time and patience. Although Afghanistan shares a border with Iran on its western side, its carpets and rugs have more in common with the tribal weavings of Central Asia in regards with color, design, and weave than with their relatively more sophisticated Persian counterparts. Just like many similar cultures, the Afghans are a nomadic, tribal population constantly moving around from one place to another. Their rugs, woven on small, portable, wooden looms, are mainly produced for use in their private homes, and almost always for decoration purposes. 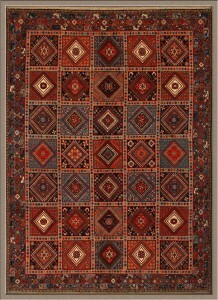 Therefore, it is not surprising that Afghan rugs are available in limited quantities and usually in smaller rug sizes. Many feature natural-dyed hand-spun Afghan wool of very good quality. Various qualities of hand-knotted rugs are available in Afghanistan, ranging from coarse to medium in weave, in addition to flat-woven Kilims. During the past few years, it has become increasingly difficult to distinguish between real Afghan rugs and those produced in Iran and Pakistan by Afghan refugees who fled their country during its war with the Soviet Union followed by the Afghan civil war. Afghan rugs are characterized by easily identifiable geometric patterns, the reason being that they strictly observe the principles of Islam, in which the display of human and animal figures is usually to be avoided. In addition, Afghan weavers have not been subject to much pressure from Western markets to produce for Western tastes. There are several types of Afghan rugs. The most widely accepted design is the “Afghan Bokhara”, represented by the gul motif, a large, quartered octagon also called “elephant’s foot”, generally displayed in columns or rows and framed within a border. They come in only a handful of different colors, the most common of which would be a rich red. 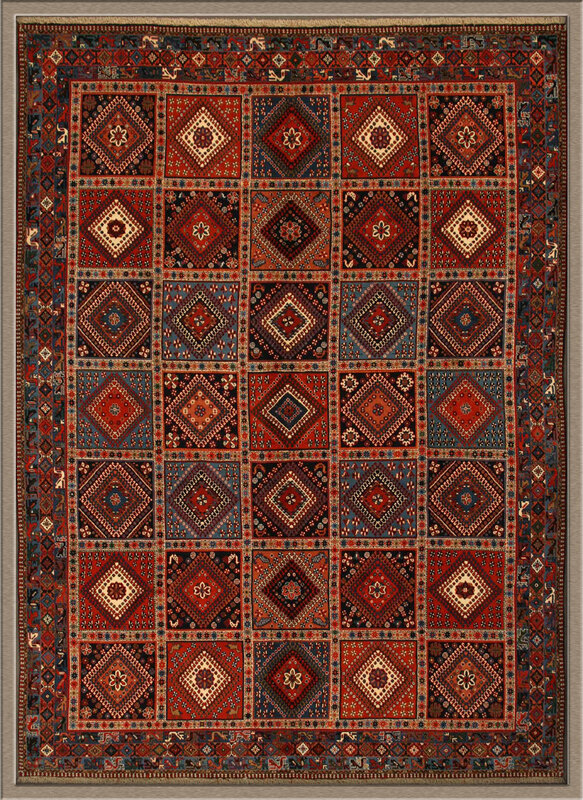 Also popular are the nomadic Balouch rugs, generally prayer rugs with geometric designs. Most Afghan rugs fall into the dark red hues (occasionally blue) with black or dark blue motifs and sometimes with minor touches of ivory or green. Lately, Afghan weavers have produced an interesting selection of “war rugs” exhibiting stylized depictions of military equipment such as tanks, grenades, and guns which are a clear image of the violent environment influencing the region throughout the 1980s. Of all the carpet types available today Afghan rugs are probably the most truly authentic expression of a weaver’s culture. They hold a special appeal for buyers seeking truly original ethnic expression in Oriental rugs.